This briefcase made of top layer cow leather. It is easy to get scratching and might get scar or fleck on surface, those are the natural witness of a created leathers exactly same in the world. Those imperfect real could not be cleaned. The longer you use the real leather products, the more gloss it will be. 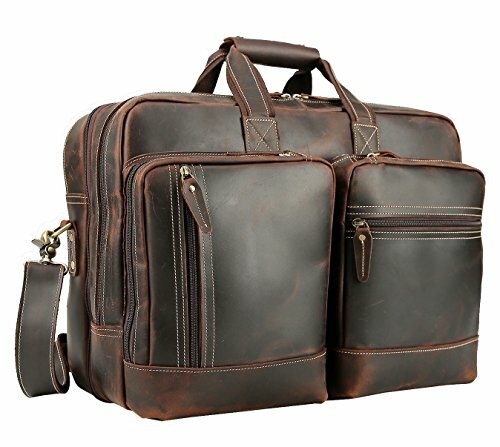 Material: Import Top Layer Cow Leather Size: 15.5L * 6D * 11.8H inches Color: Coffee Handle length: 3.7inch Net weight:1.2KG/2.64LB Style: Portable / Messenger bag Capacity: can put 15.6 inch laptop MAIN FEATURE 1. Top with double handle, drop 3.7 inch 2. Additional detachable and adjustable padded shoulder strap, its leather joined with canvas to make it more durable. Length can be adjust up to 50 inch 3. Three separate main sections and multi compartments make it functionality PLEASAE NOTE -Due to the light and monitor's measurements, the color and size may appear slightly different,Please allow a little difference from description. PLEASAE NOTE -Little new leather smell is normal. Putting it outside for few hours, the smell will disappear. 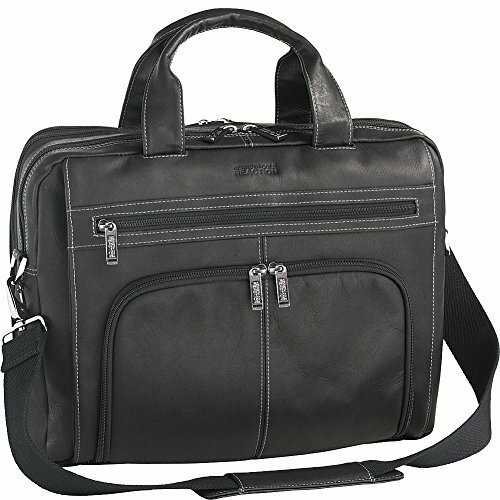 From papers and files to portable electronics and even your lunch or an extra shirt, this soft-sided, expandable briefcase offers you the flexibility your active lifestyle demands. Three large zippered sections with front zippered pockets let you organize and keep often-used items right at hand. Large zippered back section is great for larger and more rigid items. 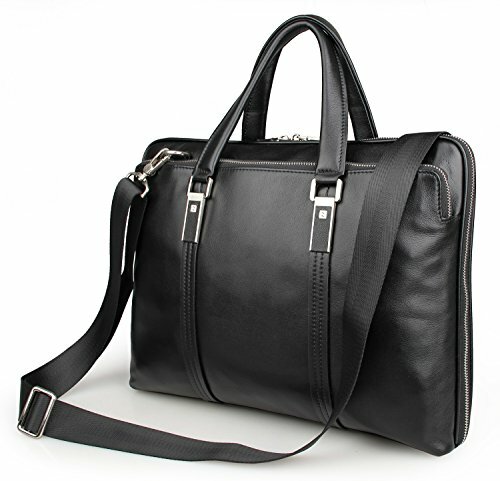 And this stylish briefcase offers you the convenience of carry handles as well as a removable shoulder strap - to suit your travel needs. Another great innovation from RoadPro, your trusted travel companion, providing everything you need for on-the-go living. 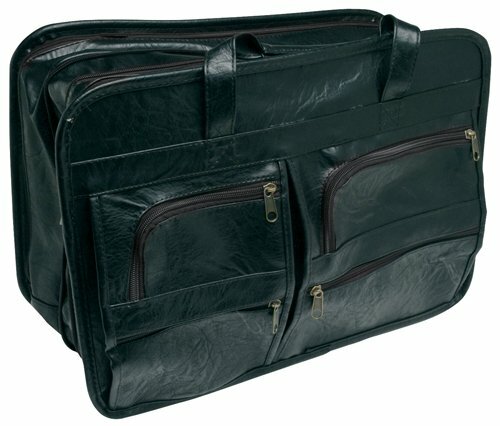 Dimensions: Briefcase Dimensions: 16.53"x12.59" x 3.94 inches(LxHxW) Laptop Compartment Size：15.85*10.76*2.18 inches(LxHxW) Exterior Front/Back pocket size:15.94*8.84 inches(LxH) Multifunctional Pockets: 3 Main Compartments: Can classify your folders,computer and store your clothes. Separate Laptop Compartment: Fits up most kinds of 15.6-16 Inch laptops,17 inch Macbook For 2017 Acer Flagship CB3-532 Chromebook For Samsung Chromebook 3 For ASUS VivoBook F510UA FHD For Acer Chromebook 14 For Aspire E15 E5-575G-57D4 For HP 15-F222WM 15.6" Touch Screen Laptop For 2018 Dell Inspiron 15 5000 The same size 16" laptop in different brands may have little discrepancy in width/length but it fit most laptops,Please check the dimension of your laptop before purchase! If you are not sure for it, you can contact with our customer service team for more details,thanks. Upkeep 1.Apply cream/moisture lotion onto the leather surface,and use a soft cloth to complete the upkeep. 2.Avoid cleaning products with alcohol, turpentine or other mineral spirits as they will discolor and dry out leather. 3.Never allow water to soak into your bag. If the bag gets wet, do not use a hair dryer on it. Instead, absorb as much water as possible with a thick microfiber hand towel and allow the bag to air dry. About US: High fashion. Italian Design. Traditional craftsmanship. Polare embodies all these characteristics, producing exquisitely crafted goods for a thoroughly modern and dynamic man.Polare brand has been specialized in men's leather bags and leather wallets over 15 years. 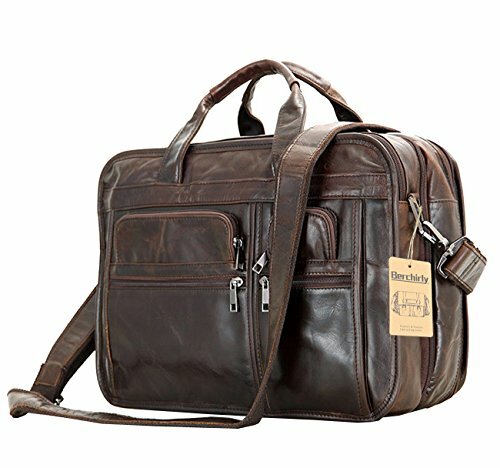 PRODUCT FEATURES: - Color : Dark Brown - Style:Messenger Bag/Shoulder Bag/Briefcase - Material: 100% Pure Full Grain Leather - Dimensions: 16.9''*7.87''*12.2''inch. - Ship From USA 1 YEAR MANUFACTURER'S QUALITY WARRANTY!!!! If you have any problem after purchase within 1 year,pls go to the order, choose: CONTACT SELLER. We will try our best to support you. 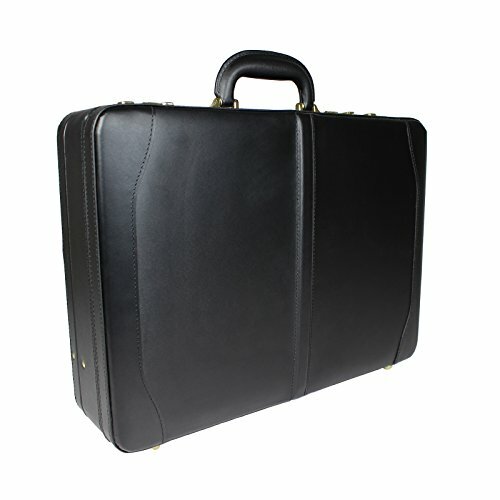 A successful man usually needs a nice briefcase which can be used in office, meeting, business traveling or daily life! 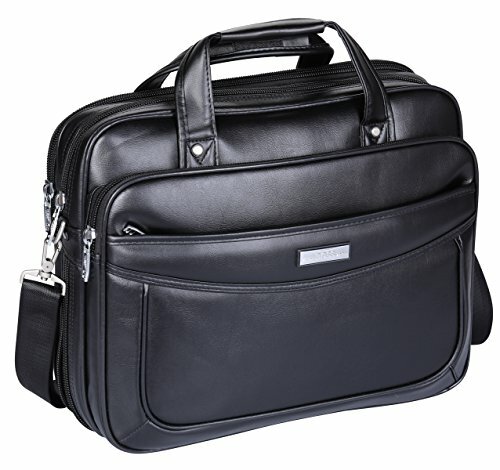 Professional Zipper Junior Pafolio - Black. Samsill Professional Junior Padfolio combines incredible utility with a timeless style & class to bring you a business accessory you'll never want to part with. The only resume portfolio/ business portfolio you're ever going to need. The old-school charm & grace of real-deal Napa Leather is back. 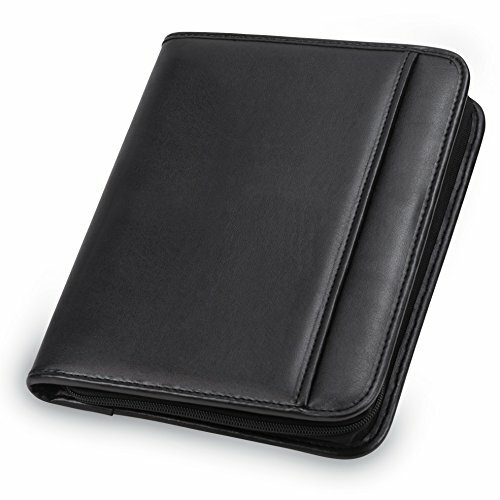 This padfolio bears authentic touch, feel & look of premium Napa Leather. 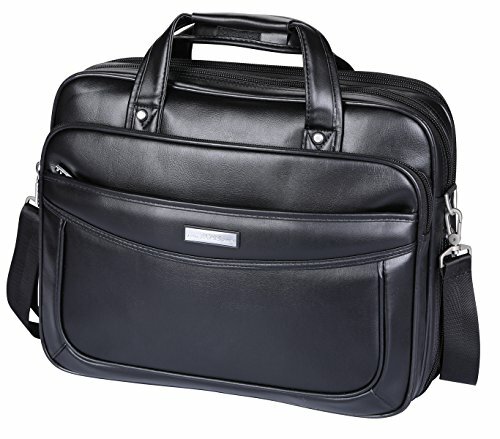 Soft-padded cover is just about perfect for all professional needs. We know you value all the stuff you'll be organizing with our business portfolio & that's why, we've taken extra care to secure your belongings with a wraparound zippered closure. Also includes an inside zippered pocket. Organize loose pages, important documents, letters, print-outs, leaflets, envelopes, business cards, photos & all sorts of other stuff with ease. Includes a refillable letter-sized notepad. Crafted in leather, this briefcase from World Traveler has timeless styling and handy pockets for all your workweek essentials. Features dual combination locks to keep your private files private and expands up to an additional space.